叶鹏鹏, 金叶, 纪翠蓉, 耳玉亮, 段蕾蕾, 李志新. Ye Pengpeng, Jin Ye, Ji Cuirong, Er Yuliang, Duan Leilei, Li Zhixin. Ye Pengpeng, Jin Ye, Ji Cuirong, Er Yuliang, Duan Leilei, Li Zhixin. Disease burden of animal injury in China, 1990-2016[J]. 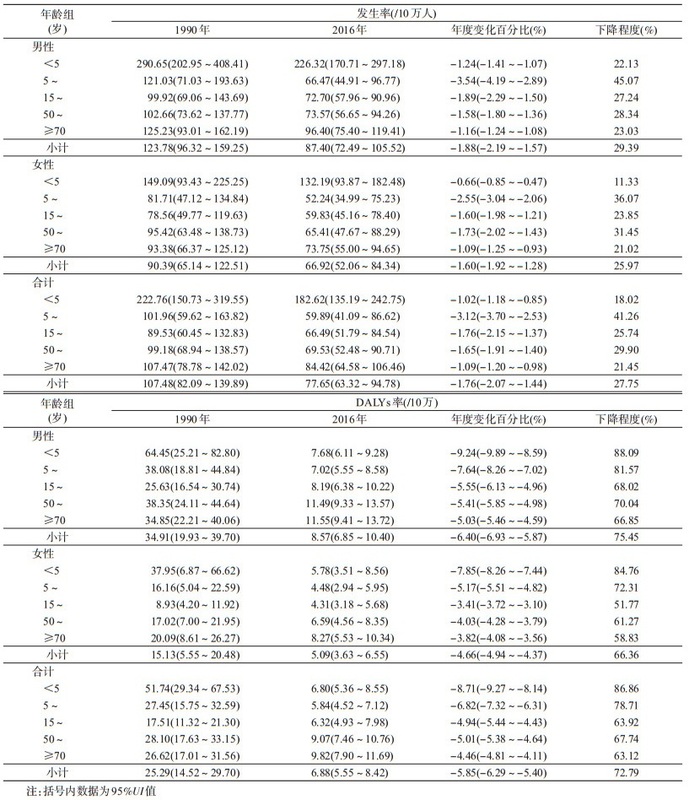 Chinese Journal of Epidemiology, 2019, 40(1): 52-58. Abstract: Objective To analyze the disease burden of animal injury in China between 1990 and 2016. Methods Data obtained from the Global Burden of Disease 2016 were used to analyze the age and gender specific disease burden of animal injury in China, using the incidence and disability adjusted of life years (DALYs) rate. Relative and annual changes were evaluated. Results In 2016, the age-standardized incidence and DALYs rate of animal injury in China showed as 245.05 per 100 000 people and 12.73 per 100 000. The age-standardized incidence of non-venomous animal injury was significantly higher than that of venomous animal injury, but the differences in age-standardized incidence and DALYs rate between venomous animal injury and non-venomous animal injury were not significant. Between 1990 and 2016, there was a significantly decreasing trend in the age-standardized incidence and DALYs rate of animal injury, and obvious decline could be seen in the incidence of non-venomous animal injury, compared with venomous animal injury. The incidence and DALYs rate of animal injury declined in both males and females and in different age groups. The obvious decline of incidence and DALYs rate could be found in children aged 5-14 years and aged < 5 years. Conclusions Between 1990 and 2016, there was a significant alleviation of the disease burden of animal injury in China. Young children were most prone to animal injury, resulting in serious disability and death, indicating more attention should be paid to this population at high risk and in animal injury prevention and control programs. World Health Organization. Animal bites[EB/OL]. (2018-02-05)[2018-07-11]. http://www.who.int/news-room/fact-sheets/detail/animal-bites. 李艳荣, 祝丽玲, 朱武洋, 等. 中国2016年狂犬病流行病学特征分析[J]. 中华流行病学杂志, 2018, 39(1): 40-43. 陈盈, 李丽萍. 国内外儿童动物致伤研究进展[J]. 伤害医学:电子版, 2017, 6(1): 51-62. 刘怡芳, 吕杰, 苏承. 天津市2009-2016年动物致伤处置门诊暴露人群流行病学分析[J]. 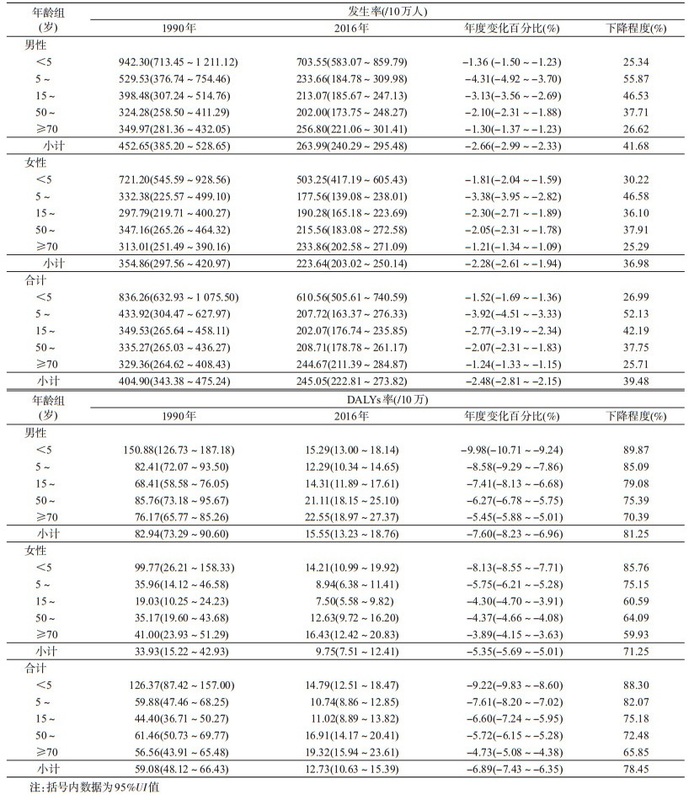 中国媒介生物学及控制杂志, 2017, 28(6): 589-591. 李秀红. 2015年动物致伤病例流行病学特征与狂犬病干预效果[J]. 中国卫生产业, 2017, 14(18): 22-23. 李小汝, 翟耀明, 宁锋, 等. 2008-2013年青岛市动物致伤病例流行病学分析[J]. 预防医学论坛, 2016, 22(2): 101-104. 马剑平, 刘盛元, 赵丹, 等. 犬类动物伤害研究现状[J]. 伤害医学:电子版, 2016, 6(2): 55-59. 黎志芬. 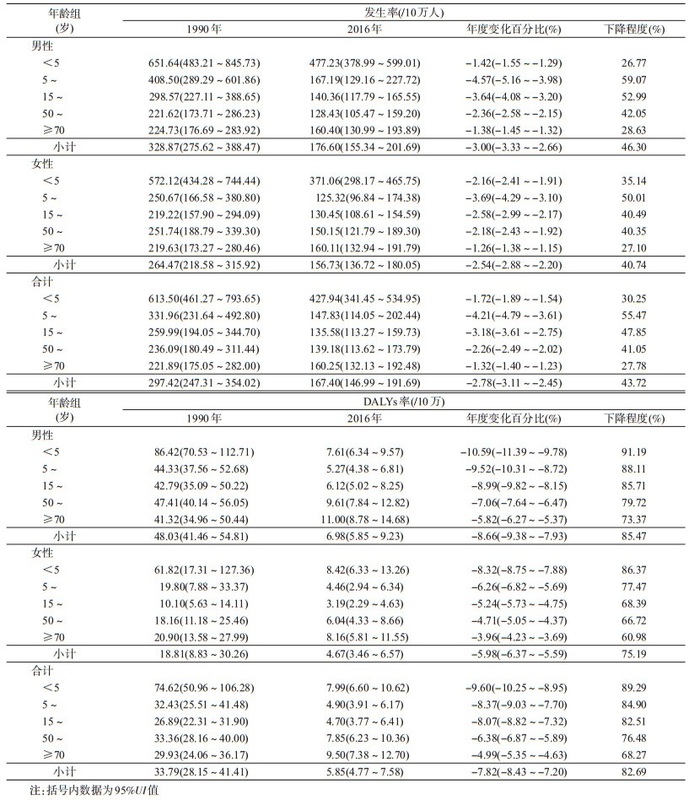 广西荔浦县2007-2008年动物致伤暴露人群流行病学分析[J]. 中华流行病学杂志, 2009, 30(9): 890. 覃公平. 中国毒蛇学[M]. 2版. 南宁: 广西科学技术出版社, 1998. Qin GP. China Poisonous Snake Research[M]. 2nd ed. Nanning: Guangxi Scientific & Technical Publishers, 1998. 蓝海, 陈远聪. 中国毒蛇及蛇伤救治[M]. 上海: 上海科学技术出版社, 2008. Lan H, Chen YC. Chinese Venomous Snake and Snake Wound Treatment[M]. Shanghai: Shanghai Scientific & Technical Publishers, 2008. 龚旭初, 杨万富. 国内毒蛇咬伤流行病学研究现状[J]. 中国中医急症, 2012, 21(5): 778-780. 林连辉, 黄鸿程, 林荣民, 等. 泉州地区毒蛇咬伤流行病学调查[J]. 蛇志, 2016, 28(1): 24-26. 袁丞达, 寇霄, 王小勇, 等. 杭州地区毒蛇咬伤临床流行病学分析[J]. 浙江中西医结合杂志, 2016, 26(7): 676-677. 赵晓东. 2011年北京及周边地区毒蛇咬伤救治情况回顾分析[J]. 临床急诊杂志, 2012(2): 75-76, 79. 王永高, 毛建芬, 金礼通, 等. 浙江沿海地区蛇咬伤流行病学及防治对策研究[J]. 中国急救医学, 2011, 31(6): 541-544. 王德征, 王冲, 沈成凤, 等. Cochran-Armitage趋势检验和线性回归在流行病学率的趋势分析中的比较研究[J]. 中华流行病学杂志, 2017, 38(5): 684-687. Global Burden of Disease Study 2016. Global Burden of Disease Study 2016(GBD 2016) Results. Seattle, United States: Institute for Health Metrics and Evaluation (IHME), 2016[EB/OL].[2018-10-18]. http://vizhub.healthdata.org/gbd-compare/. 陆建长. 我国城市养犬管理立法问题探析[J]. 时代金融, 2012(32): 130-131. Lu JZ. The exploration of dog raise management legislation issue in China[J]. Times Finance, 2012(32): 130-131. Wang J. The study of dog management legislation in Shanghai city[D]. Shanghai: Fudan University, 2010. 杜晓鹏, 徐汉坤, 郭守堂. 我国犬业管理存在的问题及对策探析[J]. 养犬, 2009(4): 4-7. Du XP, Xu HK, Guo ST. The issue of dog management and corresponding countermeasures in China[J]. J Cynol, 2009(4): 4-7. 刘小兵, 侯加法. 我国城市养犬管理立法的特点、存在问题及对策[J]. 中国畜牧兽, 2006, 38(9): 56-58. 柴浩放. 城市养犬-从限制向规范引导转变[J]. 城市管理与科技, 2017, 19(1): 44-46. 张杰, 闫俊平, 魏伟, 等. 关于《上海市养犬管理条例》的思考[J]. 上海畜牧兽医通讯, 2011(4): 86-86. 刘明亮, 张青. 《上海市养犬管理条例》学习心得[J]. 中国动物检疫, 2011, 28(6): 15-16. Shanghai Municipal People's Congress. The dog management regulations in Shanghai city[EB/OL]. (2016-03-31)[2018-07-11]. http://www.spcsc.sh.cn/n1939/n2440/n3021/u1ai127037.html. 中国CDC. 预防儿童犬抓咬伤技术指南[M]. 北京: 三辰影库音像出版社, 2016. China CDC. The technical guide of child dog bites prevention[M]. Beijing: Sanchen Audiovisual Publishing House, 2016. 李丕鹏, 王维胜, 吕晓平. 中国蛇类保护和利用概述:历史、现状和未来[J]. 沈阳师范大学学报:自然科学版, 2013, 31(2): 129-135. 张耀忠. 我国蛇类资源保护管理存在的问题与对策[J]. 蛇志, 2010, 22(4): 343-344, 348. 万冬梅, 金莉莉. 辽宁蛇类资源现状及保护对策探讨[J]. 辽宁大学学报:自然科学版, 2002, 29(4): 366-370. 魏华, 刘美辰. 《野生动物保护法》修改述评[J]. 环境保护, 2017, 45(12): 52-55. 蔡炳城, 尹峰. 全国公众对蛇类资源保护态度的调查[J]. 野生动物学报, 2006, 27(4): 2-5. 何忠杰, 任国军, 张宪, 等. 北方城市蛇伤的网络防治调查[J]. 中国全科医学, 2007, 10(17): 1453-1455. 牛金城, 王梅, 李建设. 老年人颌面部犬咬伤46例临床报告[J]. 中国实用医药, 2010, 29(5): 106-107.